ELAW partner Norma Alvares of the Goa Foundation has won a tremendous victory in India. The Bombay High Court ruled that the Grand Hyatt Hotel was illegally constructed in the protected Coastal Regulation Zone, which prohibits development within 200 meters of the sea coast and 100 meters of tidal rivers. 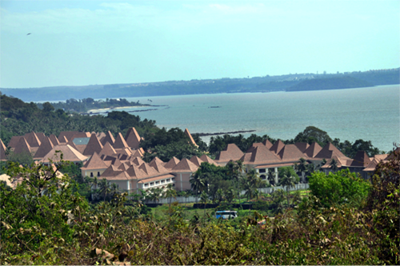 The Goa Foundation first filed this case in 2007 and fought for 7 years to show that the Grand Hotel Goa falsified plans and constructed the hotel in blatant violation of the law. Norma says: "The Grand Hyatt victory is significant because it has shown that although the international corporation deliberately cheated and tried to defeat the coastal law - by substituting the approved plans with fake ones, by colluding with the government officials to make all the project files disappear, and abused the court process by repeatedly filing applications and appeals to delay the hearing of this case - the law finally caught up with them: their shameful fraud now stands exposed and they face the prospect of the same fate that ordinary Goans who illegally constructed in the prohibited Coastal Regulation Zone were compelled to do, namely, demolition of their illegal structures." A three-judge panel will now consider what is the appropriate remedy for the Grand Hyatt's violations. Norma will be asking the court to order the Grand Hyatt to remove the hotel and restore the coastal zone. Congratulations to Norma and the Goa Foundation for winning a huge victory, strengthening the rule of law, and protecting India's invaluable coastal zone!